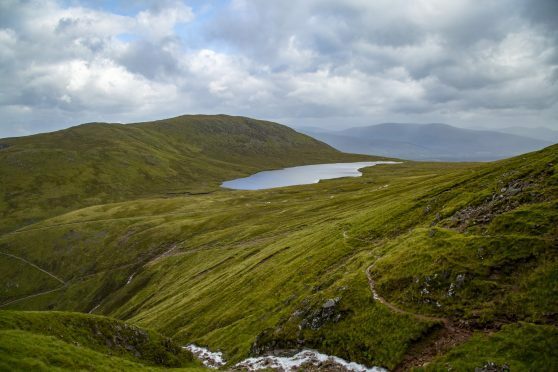 Rescuers have blasted an “ill equipped, very naive and very lucky” missing walker who was rescued from a sheer drop on the UK’s highest mountain. The Austrian hiker called for help in darkness on Wednesday night and then wandered 1.24 miles from his reported position – and stopped on a ledge above a 500ft fall. The rescue unfolded at 8.15pm when the HM Coastguard Aeronautical Rescue Coordination Centre received a call from Police Scotland reporting the man missing and ill-equipped to be on Ben Nevis overnight. The Coastguard Inverness helicopter, Rescue 951, was sent to search for the man alongside Lochaber Mountain Rescue Team in a hazardous combination of driving rain, mist and strong winds. John Stevenson, leader of Lochaber MRT, said:”I don’t think he had even reached the summit but he said he was hypothermic and said he had injured his leg. He did not have a clue where he was. “Initially we started talking him down and he got below the cloud level, but he wandered off and where he ended up he could have fallen over 500ft and rolled down the gully – he would have been lucky to survive that fall. “He was very ill-equipped. He had no torch, no gear and limited clothing for the conditions and it was freezing. He told us that it was not cold at this time of year from where he comes from – but we said this is Ben Nevis, it’s different here. As the helicopter was repositioning back to the search area, the hiker was spotted by the eagle-eyed helicopter Winch Operator Mark Lean, on a steep ledge at Five Finger Gully on the 4411ft high peak. The successful rescue also marked the 1,001st job for the HM Coastguard Inverness crews. Speaking afterwards about the rescue Winch Operator Lean said:”The casualty was hard to locate as he was wearing all black and the only illumination was the back light of his mobile phone. “Rescue 951 fortunately glimpsed him on the Infra Red camera as the aircraft was making a turn back to the reported search area. “His location was in the notorious Five Finger Gully which has a sad history of fatalities and complicated technical rescues after navigational errors by walkers.